Need a Mentor? Search our database to find a mentor in more than 1900 Categories | Join Us as a Mentor. Who are the mentors and mentees? How to connect with mentors? When to connnect with mentors? What are the mentor qualifications? Four mentoring options to explore! How do I become a good mentee? How do I become a good mentor? How do I find a mentor online?
. . . Find mentors, Coaches and Key Advisers. The people we associate with, personally and professionally, become part of our network and affect our success rate. Each of us has a unique set of friends, associates and colleagues. Our networks can help us advance or hold us back. When our networks expand, our careers build. When our networks stagnate, our careers stagnate. Networking has the potential to greatly determine how much opportunity we encounter. Building our networks involves meeting as many people as we can. This was easier in sales careers than others in the past, and as a result, the sales profession created more millionaires than other professions. It’s different now. Social media and the internet has changed the world and expanded opportunity. Regardless of our career choice, we have many opportunities for creating and expanding our networks and our careers. Aside from going the extra mile at work (which helps influence networks positively), we can go the extra mile in building networks — work and personal. Facebook, Twitter, Instagram, Pintrest, Youtube, LinkedIn and other social media sites can generate many new contacts. Signing up to blogs, email lists and listening to podcasts can help us too. Don’t forget the personal face-to-face networking options though. They are very important. We can become involved in school functions with our children, corporate sports teams, community associations, chambers of commerce, or adult education courses. There are many options, personal and online, but remember — it’s up to each individual to follow through on them. You are the only person who can build your network. Although each person’s network is unique, everyone’s network would benefit from the addition of a few key advisers. First and foremost are good mentors — people we can trust and talk too openly and who have expertise in an area of life we are working in or have a passion for. Mentors can save us much time in the world of trial and error. Being part of mastermind groups is also key to positive networking and success. “When two or more people come together in common focus, a third invisible intangible force is created likened to A THIRD MIND.” …Napoleon Hill. Get the third mind working for you. Everyone is part of different mastermind groups. Masterminding is an expansion of the peer mentoring concept and can take different forms. When a mentor and mentee come together to help the mentee, a mastermind group is formed. When two or more mentees work together to bounce ideas between them, with a focus on improvement for each other, they are masterminding. Work teams are mastermind groups: A sales team is a mastermind group focused on increasing sales. An accounting team is a mastermind group focused on tracking funds. Often, work mastermind teams could benefit with more focus on goals and communication structure. Hiring a coach to facilitate might help your work mastermind teams be more effective. Even families are a type of mastermind group. They typically focus on maintenance and expansion of love. Get the third minds working for you! Make sure members in your mastermind groups are on the same page — that they are clear on goals and progress for the group, and the goals for individuals in the group. Set a schedule for meetings and keep to it. Even if one member can’t make it to a meeting, do the meeting with who can. It’s a good idea to acquire two additional network components. When I was starting my cellular phone business, a mentor told me to make sure I had good advisers for legal and accounting processes. Especially when we are self-employed, but even if we are not, having a good lawyer and accountant keep us safe and informed on legal and tax matters. If we are determined to proceed on the path to success, we will without doubt need accounting and legal advice at some point—whether we’re buying a house, doing our taxes, or closing a deal on a corporate merger. As our wealth builds, good accountants and lawyers become more important. I think it’s important to have a couple communications mentors. Communicating is something most people could become better at. I’ve found, when I survey employees for companies, it’s the most identified issue for improvement in businesses. When we are faced with crucial conversations and difficult circumstance, how we communicate is very important. I will often make a phone call to a communications expert before I tackle a tough situation or conversation with others. I encourage those I coach to do the same. Another key adviser might be a good psychologist. There are many obstacles on the path to success — career setbacks, emotional struggles, and self-doubt to name a few. A psychologist can help us deal with complicated emotional processes during difficult periods. Psychologists are expensive, however, so if funds are unavailable, we can seek a life process mentor—a compassionate friend or advisor whom we trust enough to share the intimate details of our life. Typically, this is someone we respect and admire, and he or she will have experienced the same situation or issue we are experiencing in our life. Be careful with life process mentors and psychologists. We don’t want one that will enable us, and allow us to stay stuck in our past emotional traps and dysfunction, justifying our inability to move forward. We want to acknowledge our dysfunction and get tools to move through it, over it, under it, or around it when it triggers. Progress is what matters if we want to grow into all that we can be. For successful people, the process of building networks continually shifts. People in our network can play different roles at different times. When I was deciding to move my cellular phone business to a larger store, I hired one of my mentors as a consultant/coach to help me complete a business plan and hire sales people. He coached me on what to say to the bank in order to get financing and on how to interview prospective personnel. In essence, he coached me on making decisions, like he always had as a mentor. During this period, the relationship was similar but intensified because I was paying him for a specific purpose. Mentoring is free, coaching is done for a fee. Later the relationship shifted to one of peer mentoring. For successful people the process of building networks seldom stops. They understand that the more people they know, the more advice they will receive, the more sales they will make and the more fun they will have. If they can think of one or two people they’d like to adopt as mentors or peer mentors, they adopt them. We can do the same. We do not have to accept everything our mentors, accountant, lawyer or psychologist says as the absolute truth, but we can listen and decide what is best for our situation. The more opinions we collect from people we trust, the more options we become aware of, and the easier it becomes to make decisions. We can save ourselves a great deal of time and hardship by listening to capable people whom we trust to have our best interest in mind. Go out and build your network. Shift it where it needs to be shifted. Be open. Be confident and grow. If You Want Your Life to Change, Get Better at Masterminding! I first learnt about masterminding reading Napoleon Hill’s books. He wrote many books on the subject of being successful and growing rich. Basic success principles haven’t changed for thousands of years. Hill interviewed thousands of the world’s most powerful and influential people throughout most of the 1900’s — Ford, Churchill, Gandhi, Bell, Edison, Roosevelt, Carnegie, etc. Writing about success was his life’s mission. In every book he devoted an entire chapter to the masterminding principle. He said everyone he interviewed told him they owed much of their success to the mastermind principle. Great men and women around the world use masterminding principles in their daily life — always have. They build incredible networks where they source information to help them make wise decisions. Ask any successful person and they will confirm that their accomplishments happen as a result of using strong teams and implementing ideas from other people. Using other people’s money is one way of getting help from others. It’s involves using a finance mastermind group for the business. One of Canada’s billionaires (Ted Rogers) once told me in a luncheon that he would borrow as much as people would lend him as long as he could cash flow the commitment. If they’ll lend him a million, he’ll take it. If they want to lend him a billion, he’ll take it, to help him achieve his goals. He used masterminds in every part of his business and made sure his people kept them effective. His team of vice presidents was the lead mastermind group and they coordinated the successful business culture through the many down-line mastermind groups. 1. A mastermind group focused on happy customers. 2. A mastermind group focused on happy employees. 3. A mastermind group focused on happy suppliers. 4. A mastermind group focused on leading the above three groups to keep the shareholders happy. It’s a four win situation and great success tool. In smaller companies, the mastermind groups may be smaller and some of the members may not be employees. An accountant, lawyer or business coach may participate in some small company mastermind groups. In very small companies and start-ups the mastermind groups have to be assembled in the form of mentors, and/or service providers you might contract too, or buy from. We want to mastermind with people who don’t necessarily work for our company full time, or at all, in a start-up or very small business environment. I started a cellular phone business in the late 1980’s from the trunk of my car and built it to three stores and 3 million in annual sales over a nine year period. At first I was working by myself with service providers to back me up. The service providers became part of my mastermind group for customer service. It enabled me to use the word ‘we’ when talking to customers about exceptional customer service, even though I was a one-man business at the time. A very important word to consider using when talking to customers, suppliers or colleagues is ‘we’. A mentor once told me to always use the word, ‘we’, when talking to customers, even though I was a sole proprietor at the time. Using the word ‘we’ gives the large customers confidence they are dealing with a team that can meet their service requirements. No-one accomplishes a major goal in life without the help of others. Success is a ‘we’ situation. Using the word ‘I’ is not inclusive of the team needed to service a customer or supplier, even if that team is not employed directly by my company. ‘I’ can be interpreted as egotistical expression — turning customers off. ‘We’ is accurate. If we’re selling a product, we bought the product from someone so it’s the manufacturer and my company providing the product and service. It’s not ‘I’, it’s ‘we. Where do we find the people so we can assemble our mastermind groups for a start-up company? When building the cellular phone business, I had a minimum of four mentors to call to discuss challenges with. I would call different mentors for different challenges. I was very fortunate to have many mentors by the time I started my own business. Past managers, co-workers, suppliers and customers who I established relationships with while working for other companies became friends and mentors throughout my career. My mentoring network continues to grow vertically— more mentors and mentees. I use mentors and mastermind groups for important aspects of my life. I have communication masterminds I consult with to keep my communication skills honed. I have spirituality masterminds I consult with to help maintain my integrity. I have business masterminds to help keep me successful. I see my family as a mastermind group for healthy loving. I see my network of friends as a mastermind group to keep my life balanced between work and fun. Mastermind groups can be utilized in different formats. In a business the most common format is a face-to-face meeting. In a very small business the most common format is by contacting at least four different mentors on the phone in separate conversations, or in separate meetings. I talk to at least four guys about current issue or challenges. After listening to each, I decide which information is right for me to use, and act accordingly. In all cases masterminding uses more than one mind to discover and evaluate options and help make wise decisions. Two minds are better than one, but what is the ideal group size for accomplishing goals? A mentor once shared with me what he called a ‘channelled from above’ idea on masterminding: “Four wise men close and two distant make up the nucleus of your mastermind. One of the four is two.” I was 17 when he shared it with me and I had read 3 of Napoleon Hills books by that time so I knew exactly what he meant by mastermind. From the beginning of my work career I’ve watched and evaluated effectiveness of groups focused on objectives. The most successful teams I’ve been on, and witnessed, used the channelled mastermind formula. “Four wise men close and two distant make up the nucleus of your mastermind. One of the four is two.” ‘One of the four is two’ means to me that it’s best to have someone who can play devil’s advocate in the group — seeing both the positive an negative consequences of each idea. An effective mastermind group includes a participant that can explain two sides of any story. ‘Two wise men distant’ can mean having two members of the mastermind group that are not always present at the meetings but hear about the agenda and offer input through one of the four close members. An accountant or lawyer might be two distant members of a business mastermind group. Mentors of primary, ‘close’ mastermind group members might be the two distant members of a mastermind group. In all cases, when I see four strong members in a business mastermind group I see success. In the early part of my sales career I was part of a four person sales team. We were all very young and inexperienced in the industrial rental equipment field and had just gone through a huge economic downturn. We were also starting an aviation rental business. The company we were working for fired their entire sales team and hired a new young sales force. All of us were under thirty and closer to 25 years old. Every night of the week this team met with our sales manager and each member discussed our entire day’s activity. We masterminded our sales process with the team every day. We all learnt from each other what the best words to use, or approach to take, would be with different types of people and different companies. I received raises every six months because of performance. Sales grew 30% year over year for 3 years until I left for another opportunity. I was sales manager of a large industrial rental company selling to large plants and construction companies at 27. At 28 I started a cellular phone business. We used the channelled mastermind formula to help build the cellular phone business. I’ve been doing business consulting and coaching for 15 years now and we help customers build and adjust their mastermind groups using the same formula. Your success will relate directly to how effective your mastermind groups are. Life and business is a team effort. Masterminding is happening in your life whether you like it or not. Are you directing it to your satisfaction? Are your outcomes what you want? Remember the definition of insanity: “Doing the same thing over and over and expecting a different result.” If you want your life to change and get better, get better at masterminding. To get better at masterminding, you have to become a great communicator. Look for our next blog post on being a great communicator — communicating from the HIP (Human Interaction Process). Sign up to our newsletter below to receive posts directly in to your mailbox. How to find a business mentor! How to find a business mentor online and in your community and plan for your mentor sessions. How do I find a business mentor? Many people are looking for business and career mentors. Career mentor categories are the most popular at Http://FindAMentor.com . When you need to expand your mentor network beyond your community for any reason, the internet is the next best place to look. Having at least four mentors for each aspect of life that is important to you is a very good idea. We’ll give you tips for finding a business mentor in your community or on the internet in this blog. We’ll tell you how to plan your request for mentor and your mentoring conversations to build your confidence. We suggest starting by trying to find a mentor in your community or city. Mentor relationships are best with face to face communication when possible. Four key aspects of effective communication are present. (Facial expression, body language, voice tone, and word selection.) Each time we remove one of the four key aspects of communication from the interaction, the effectiveness can decrease. The first thing to do in order to find a business mentor is to identify your first choices for mentors in your community or city. Who do you admire in your field of business? Do some research. Try going to industry events like lunches, seminars, talks and conferences. Join community groups — your local chamber of commerce is a great place to start. Chambers of commerce often host networking events and meetings that bring beginning entrepreneurs and successful businesspeople together. Talk to people, listen to their stories and pursue further meetings with those whom you can learn from. Be sure that you choose someone who has experience and connections within your area and level of business. If you’re a budding entrepreneur in, say, the building and home repair industry, you shouldn’t waste your time trying to court a senior executive at a multinational engineering company. Focus on finding someone who has started a venture that’s similar to yours, and who understands the trials and tribulations of building a business in that area. Keep in mind that an adviser who offers his time in return for compensation is not the same thing as a mentor. While advisers and consultants can be very helpful, true mentors are effective partly because they are only interested in helping others succeed. Write or type all the names down of people you’ve identified as potential mentors. Beside their names, write down what you admire about each of them and how you think each can help you. Make a list of requirements for a mentor you want to find online that you don’t know yet. What type of experience do you expect them to have? Are they working now, or are they retired? Does it matter? How much experience do they need to have to be your mentor? How old should they be? What do you want to learn from them? Which positive emotions do you want to learn to invoke? Confidence, patience, persistence, gratitude, humor, belief and perseverance? Positive emotion is critical to achieving goals. This is like goal writing and writing down goals is the most important first step to achieving any objective. Do what works best for you. Write your goals and lists on paper or type them in a document you can save. When you write down what you admire about your potential mentors, you identify personality aspect and intellectual goals for you. You have now written goals for what, and who you, want to become. Now that you have your list, prepare your request for a mentor—plan your introduction conversation with them, or their assistant, and plan your email. Look at your list. Write down the good things you want to tell them, about them, first. Then write down what you want to tell them about why you want them to mentor you. Tell them why you would be a good mentee. Decide how long you want your first mentor session to be. I suggest asking for 15 minutes of their time for the first session. If there is something you can offer them, do so. Write out your introduction conversation and your introduction email. Keep it short and simple. Have someone edit your introduction email and read it before you begin sending it out. Make it right. List contacts you have, that might know the mentors you want to connect with. Research, on the internet, how you might contact your potential mentors. Begin to connect. Warm contacts or introductions are best. Call and ask your friend to introduce you if the option is available. If you don’t have a common acquaintance, you can try phoning them, or their assistant, and asking for a short mentor session using your preplanned introduction conversation. If you don’t reach them on the phone, send your pre-planned letter or email to them. If you don’t find a mentor in your community, don’t give up. Try the 100s of online mentor sites. Begin at http://FindAMentor.com. Join the site; build a profile in the career category you are looking for a mentor in. Search the database for mentors in that category. If you don’t find one right away, check back every month or so to see if a mentor is joined in that category. If FindAmentor.com doesn’t have the mentor you are looking for, check their Mentor Resources and Website page. Look in your geographic area and then for sites that have mentors in your field of interest. If you don’t find the right website there, then search in Google the specific type of mentor you want. For example search the words ‘business mentor’ or ‘engineering mentor’ or ‘carpenter mentor’, etc. There are many business mentor programs available online and/or through professional and trade organizations. Some unions may offer them as well. Look for sector– or industry-specific events and groups on Facebook; subscribe to useful newsletters; follow interesting or relevant individuals from your region on Twitter or LinkedIn; then get in touch and ask questions. Now that you’ve found your mentor it’s time to plan for your first session. What do you want to accomplish and learn about? Write it down. What questions are most critical to ask? Write them down. (2 max — you want to keep within time limit of 15 minutes). Agree on an action item or items for you, the mentee. Write them down during the meeting so you can report back the next meeting. Watch the clock. Close the session on time or ask to talk longer if it’s going well. Decide if you will have another mentor session with this mentor and set the time and time limit. All this shows professionalism and respect for your mentor. It’s a good thing. Begin to do what you said you would in your mentor session. Every time we cross an item off our list, we gain confidence and feel better about ourselves. Use lists, cross items off and build your confidence. It’s up to you. Just do it. If you are in a position to share the skills you have learned, you should give back by becoming a mentor yourself. Finding success is hard work, and entrepreneurs could use a little help along the way. As the American businessman Zig Ziglar once said: “A lot of people have gone further than they thought they could because someone else thought they could.” So get out there and find the right mentor to help you along the path to success. In closing, remember to make your list of potential mentors and what you like about them, write out what you want to learn from them, plan your introduction conversation, and begin to connect. Try warm contacts first, and then try phoning and then emailing. If you don’t find a mentor in your community, try online at different websites. Plan your first mentor session; key questions you want to ask and what you want to learn from the session. Watch the clock, keep the session to the time limit you agreed on, and ask for an extension of time if it is going well. Agree on an action item for you to complete, and report back on in the next session, if you agree to a next session. Just do it. Your confidence will build as you succeed. Never give up. Perseverance, persistence, patience, gratitude and belief are all key ingredients to success. Build the positive emotion and you will succeed. Your mentor will help you. Good luck with your new connections. Thank you for reading. January is National Mentor Month. Be a Mentor! Be a Mentor! January is National Mentoring Month. Millions of people around the world and in your community are looking for a mentor. Be a mentor to someone new this January either online or in your community. “Mentoring Transforms Adversity into Achievement.” The Mentor News. I take on one new mentor each year from FindAMentor.com and then I hide my profile so I’m not flooded with requests. Most of us mentor many people and we have many informal mentors. I mentor my sons, their friends, my nieces and nephews, business colleagues, spirituality friends, etc. Some people I mentor once a month, others once a quarter or once a year. The mentoring relationship differs with each mentee and usually shifts over time in each relationship. Some of my mentors I only see once a year now. As a mentor, we can set the time frames for a mentee relationship. I allow 1 hour per month of time for new mentees. Often, after the first session, time requirements diminish. Mentoring is a lifelong natural process we all do to different degrees as mentors and mentees. Remember, mentors often learn as much as their mentees in a mentoring relationship. They feel rewarded. What type of experience do you expect them to have, if any? Are they involved in the field of interest of career now, or just wanting to be? How much experience do they need to have to be my mentee, if any? Should they be male or female? Ask the mentee questions to determine if they are a good communicator. What does a good communicator look like? Ask questions to determine what emotional process habits they have and if they are the right ones to succeed. Can you help them with confidence, patience, persistence and perseverance? Ask questions to determine what knowledge they have in your field right now. What do they need to know that they don’t now? Peer mentoring or masterminding is a great option if you want to have far reaching affect. Masterminding is simply a group of people working together and meeting regularly to achieve common objectives. Napoleon Hill identified Masterminding as one of the common denominators required in achieving success of any magnitude after he interviewed thousands of the world’s most successful people. Any executive team is a mastermind. Sales teams, accounting teams or production teams, etc., are all mastermind groups. 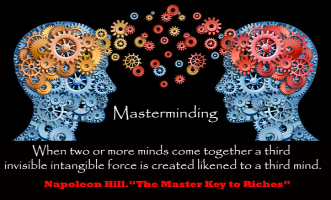 When a mastermind group is active, “a third invisible intangible force is created likened to a third mind’, writes Napoleon Hill. Hill devoted an entire chapter to masterminding in each of the many success tool books he wrote. Have 4 to 6 people in the mastermind group. The group identifies objectives each member, and the group, wants to achieve. Minutes are taken in each session by one of the members. Often the minute responsibilities are shared from session to session. Minutes are typed and forwarded to each member. The senior mentor shares the knowledge and emotional traits necessary to achieve objectives the group has identified. The mentees discuss how to utilize the knowledge and invoke the emotional traits determined necessary to succeed. In each session, each mentee identifies goals to be achieved and practical actions they are committing to accomplishing before the next session. In each session the mentees discuss their actions and goals achieved, or not, since the last session. Wins and challenges are discussed in detail by each mentee or mastermind member. Learning curves are increased dramatically when each person’s daily, weekly or monthly activities are shared and listened too. When there are two people sharing we learn twice as much, twice as fast. When four people share we learn four times as fast and four times as much. The most successful masterminds I’ve witnessed in a business environment meet every week day. I’ve seen sales teams increase sales 30% year over year in a tough economy as a result of meeting daily. I’ve witnessed customer service teams increase product knowledge and improve customer service dramatically when the team meets daily. Meeting schedules are more demanding in a business team environment. Peer mentoring type masterminding with different purposes require much less time. I meet with a spirituality group once a week. Common mentoring is a type of masterminding as well. When I meet with one mentor I am masterminding my development. When I call four different mentors and ask for an opinion on a challenge, I’m still masterminding using a different format. I take what fits for me from each mentor and discard the rest. Having at least 4 mentors for every aspect of life that is important to you is a great idea. I personally have four or more business mentors and the same for spirituality mentors. I have 4 communications mentors. I have mentors for hobbies like construction or renovations. We can and do have mentors for many aspects of life. It’s a good idea to continue growing our mentor network. I meet new people every year that I use as mentors. Be a mentor to one more person this year. Millions of people are in need of guidance and searching it out. If you find a new mentee on-line at FindAMentor.com or another website utilize the ‘Tools and Tips’ pages (top menu on home page) at FindAMentor.com. There are mentee and mentor questionnaire forms that you can use to help you verify the authenticity of someone you meet on-line as a prospective mentee or mentor. There are tips for being a good mentee and mentor. There are tips for the different types of mentoring you might be interested in utilizing for your company or organization. If you need a daily inspirational email from us, join the emailing list. We won’t send you spam, we will just inspire you every morning with some inspirational quotes from a different mastermind group each day. We want to motivate you to achieve your goals. Go out and make it a great day. Thank you for reading. Please tell your friends to mentor someone. Millions of people are looking for mentors. And we can all be a mentor to someone in at least one field of interest. Mentoring is a lifelong natural process, we all do to different degrees. When we focus on utilizing mentoring more, we grow and achieve our goals quicker. No matter how smart you are, or how brilliant your business concept might be, or how successful you are in life, every person needs someone who has already been through what you are experiencing right now in life, and he or she has come out the other side armed with invaluable insights. Mentors can help others avoid costly mistakes and gain whole-life knowledge. The next question is what kind of person you should be looking for and how do you verify that this is the right person that can be my mentor. Mentors are people who think they can offer guidance to others in a particular area of expertise. They have experience and formal knowledge to share so that mentees can be effective, avoid costly mistakes, communicate better, and have more fun. Watch this 9-minute video on how to find a mentor online or in your community. How much experience do they need to have to be my mentor? Are they a good communicator in my mind? What does a good communicator look like? Can they build my confidence and help me believe in myself? Can they help me with persistence and perseverance? What is important to me? What qualities do I want my mentor to have? Mentors are people who are really good at a particular aspect of life. That doesn’t mean you want to be exactly like them or that they are really good at all aspects of life. It just means that you want to learn some things from them. You can have many mentors. Having at least 4 mentors for every aspect of life that is important to you is a great idea. Select a person that you think can be your mentor and find a way to start a conversation with them. You could try striking up a conversation, phoning or emailing them. If it’s someone that you have found online at a mentor search website like http://FindAMentor.com, have them fill out a FindAMentor.com mentor questionnaire. Check their references and place of employment to verify they are who they say they are. After you verify them and when you are comfortable, exchange phone numbers and when possible, meet face to face. Remember About 70% of communication happens through body language and facial expression. Face-to-face conversation is the most effective type of human interaction and communication. Voice-tone contributes another 10%-20 %. Only 10% of communication or less is through words themselves. The second best way to communicate with a mentor is on the phone or with Skype. Only when person-to-person and phone interaction is not possible, communicate with email. When communicating with email it helps to state clear emotions and intentions in your writing. Do it. Masterminding is a great alternative type of mentoring (also called peer mentoring), and can be used until you find the right mature mentor in the field you are searching. It can always be used as a great supplementary mentoring forum as well. Last meeting challenges discussed and what did I did to overcome them. What I want help with. Remember to give something back. We are all mentors to someone. We exchange life experience with mentees and help them learn from others mistakes so they can avoid the mistakes that were made in the past. Mentor one more person each year. I have made a commitment to add one mentee each year from FindAmentor.com. Each mentoring relationship requires different time commitments. When I mentor people, I allow 1 hour per month at first. If a critical situation arises, the mentee can call me anytime. Later in the mentor/mentee relationship we meet less. I meet with some of my mentors only once a year. Others, once a quarter. I follow the same rules with my mentees. Now if you are still reading this, then you have understood the meaning of the mentoring process and it’s more clear to you, what kind of person you are going to find and how you will proceed in finding a mentor or a mastermind group. Let’s start your search by joining us. Remember, you must create your profile as a mentor or mentee in the specific field you are interested in. Good luck with your mentoring initiatives. Read our “Tools and Tips section” from the top menu, to know more about how mentoring and how our website works. If you need a daily inspirational email from us, join the emailing list below. We won’t send you spam, we will just inspire you every morning with some inspirational quotes from a different mastermind group each day. We want to motivate you to achieve your goals. Go out and make it a great day. Thank you for reading. Please tell your friends to mentor someone. We have thousands of people looking for mentors. And we can all be a mentor to someone in at least one field of interest. If you have any questions regarding how the website works, read our FAQs or watch the How to Use FindAMentor video. We Want to help, Tell us your Struggle. Watch Free Life Coaching Video Series and Download People Tune Up Workbook. FindAMentor.com is an organization operated by Novacom International Limited of Edmonton, Alberta, Canada. We provide free web matching service for mentors and mentees.